Claude Monteux - Flutediva - Hard work beats talent when talent doesn't work hard. Claude Monteux has established a dual international career as both concert flutist and conductor. As a flutist, he played under the batons of Toscanini, Walter, Beecham, Stokowski, Casals, Stravinsky, and his father Pierre Monteux. On the podium he served as Music Director of the Columbus Symphony (1953-56) and the Hudson Valley Philharmonic (1959-75). 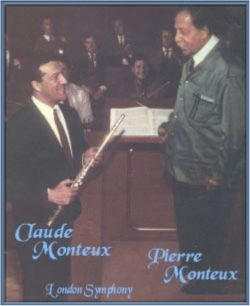 Mr. Monteux studied flute with Georges Laurent, then principal flutist of the Boston Symphony and conducting with his father, both privately and at the Monteux School for conductors. He has appeared in concert and in recording with orchestras throughout the world, including the London Symphony, the Royal Philharmonic, the Pittsburgh Symphony, the NBC Symphony, the Metropolitan Opera orchestra, and has guest-conducted orchestras in Berlin, Paris, Brussels, Norway and Holland. He has recorded extensively on London, Phillips and other labels, including concerti by Mozart and Bach with the Academy of St. Martin-in-the-Fields. Mr. Monteux has served on the faculties of the New England Conservatory of Music, the Peabody Conservatory, Vassar College and Ohio State University. Now affiliated with the SDSU School of Music and Dance, he spends his summers in Maine, where he is Musical Advisor of the Pierre Monteux School, coaches chamber ensembles, and works privately with conductors in their score study.